“I looked back and they couldn’t work with me anymore. lt was time to go for the finish." Having already finished second in stage 9, Alexey Lutsenko again proved that his status as former U23 world champion is no coincidence when he emerged as the strongest from a very strong break in today's stage of the Vuelta a Espana. In the end, the Kazakh was caught but again proved that he is a man for the future. “I looked back and they couldn’t work with me anymore," Alexey Lutsenko said after stage 13 at the Vuelta a España. "lt was time to go for the finish." The Kazakh rider jumped into and out of the day’s long breakaway, and escaped solo before an uphill finish in a wild animal park. Lutsenko and his teammates planned from the start to put an Astana rider in front for this 13th stage – a test for strong specialists but no real threat to the overall rankings. Fabio Aru finished with his main Top-10 competitors and there was no change to his seventh in the General Classification. 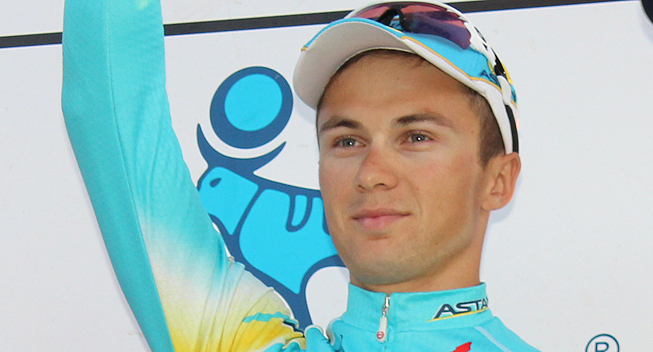 Lutsenko rode solo for nearly 5km after his breakaway companions could not remain at his side. At 7km to the finish Lutsenko and the peloton regrouped.